There’s an interesting irony at the heart of musical performance. As musicians, we spend countless hours in the practice room in order to achieve the highest level of technical control. Technical assurance gives us the freedom to let go, enter “the zone” and allow the music to come to life. We cherish the rare, exhilarating performances which rise above “good” or “technically solid” and tap into a higher energy. At these moments the music almost seems to be playing the musician. Discovering the ability to let go and overcome ego is a lifelong challenge for all of us. 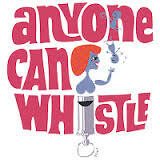 [quote]Anyone can whistle, that’s what they say-easy. Anyone can whistle, any old day-easy. I can dance a tango, I can read Greek-easy. I can slay a dragon, any old week-easy. Notice the contour of the melody and the way it relates to the words and the character. Sondheim gives us a dissonance on the word, “hard” (1:19), evoking a feeling of “hardness”. Other notable songs from this show include Me and My Town, There Won’t Be Trumpets, A Parade in Town, Everybody Says Don’t and See What it Gets You. One of Sondheim’s earliest shows, you can hear echoes of his later works in the score of Anyone Can Whistle. What a lovely song – thank you. It should be much more well-known! I agree that this song is a somewhat forgotten gem, Linda. And it’s hard to imagine a better performance than Remick’s. She wasn’t a great singer but she conveys the drama of the song beautifully and this is the essence of Sondheim. Sondheim’s songs are windows into character.